On our last day in Singapore, we decided to take a ferry out to Palau Ubin island which is touted as "Old Time Singapore". The island really is olde timey. Most people who go there rent bicycles to get around. We did too. It was really fun. We had a few target birds on our list and our guide gave us a map to locations on the island where we were most likely to be seen. We got our main target, but not where Con told us to find it. This beauty was sitting out along the boardwalk trail as if he was waiting for us. 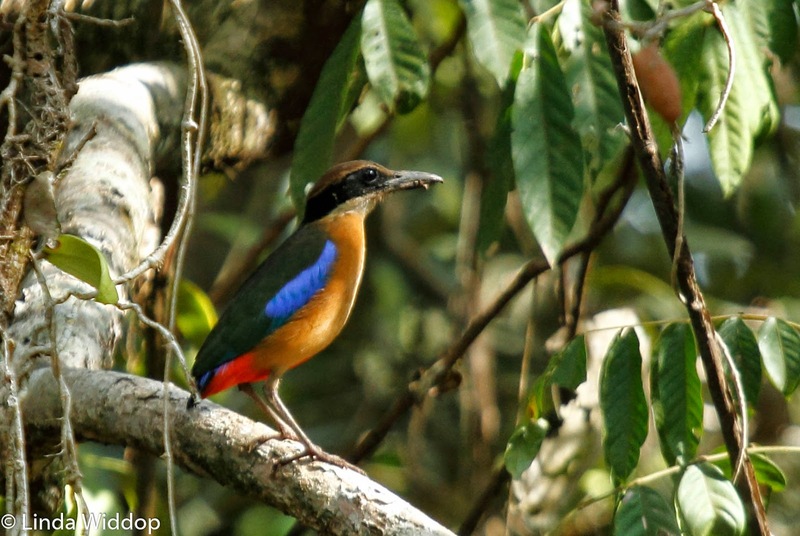 This is Mangrove Ant Pitta - a bird that skulks around mangroves in the shadows. This bird didn't get that message which worked to our favor. Diane and Barbara found the bird while I was meandering behind taking photos of another creature. This is something that you see on National Geographic and figure that the magazine photographer had to wade deep into the jungle or something. But here it was, swim/walking right next to the boardwalk. 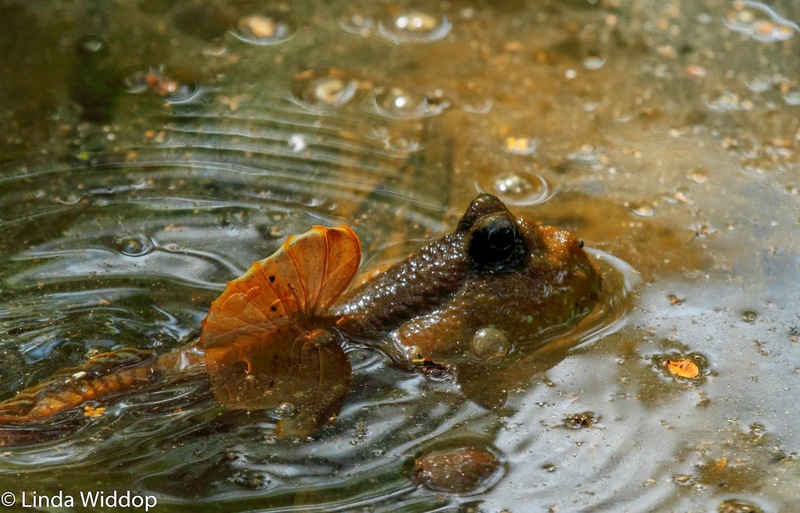 I think its a mud skipper which is a fish that can breathe air. It swims and also wiggles around on the mud and can maneuver on land. Wow. I thought Diane was going to crash her bike at one point. We were cruising downhill. Di was in the lead with me following close behind when all of a sudden she goes out of control in a big cloud of dust. 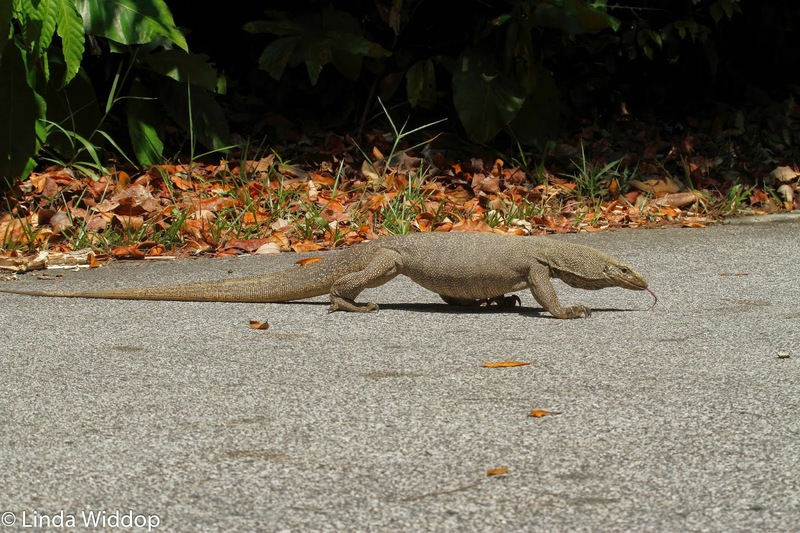 I swerved to miss the mess but caught a glimpse of a giant lizard slithering into the woods. I thought Di was going to crap her pants! We got to see another one of these giants a few minutes later. This one didn't scurry into the woods when he saw us. He was as long as the bike, so I guess he figured we weren't a threat. Check out the forked tongue that he uses to taste the ground. Freaky. 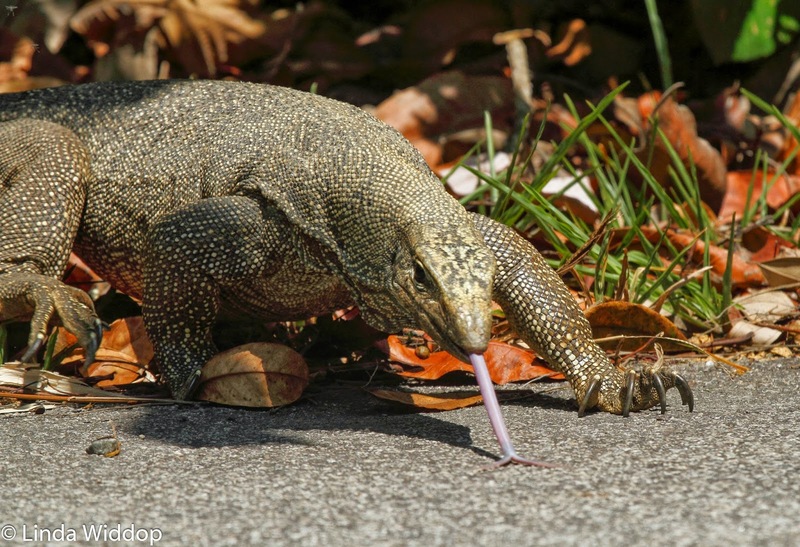 And zoom in to see the claws on this Monitor Lizard. Wow. Thank goodness people are not on this guy's menu. We saw one more of our target species on the island too. 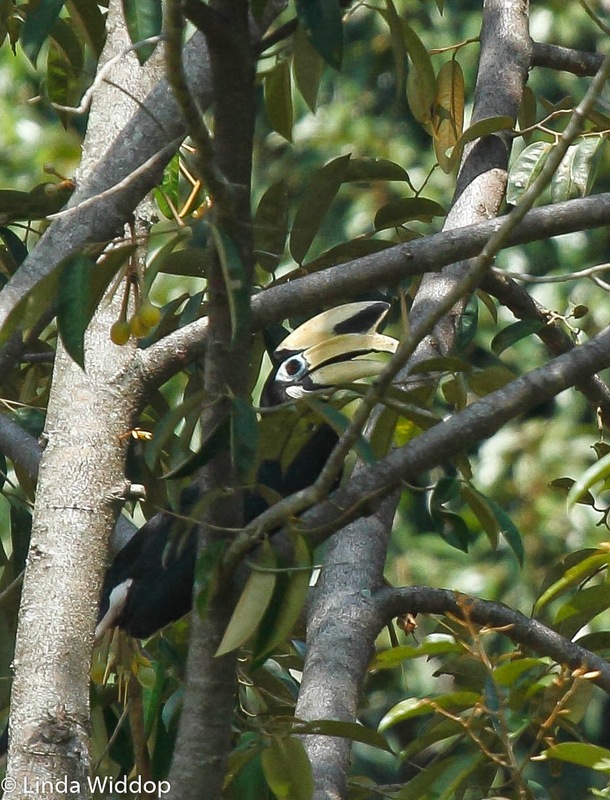 We had seen a few flying high over the forest in Malaysia, but seeing a Pied Hornbill eating fruit was so much better. The photo isn't great. The bird was buried deep in the tree but you can see the pale yellow "horn bill" that gives this type of bird their name. We saw some pretty things too like these flowers. There are flowers all over Singapore. 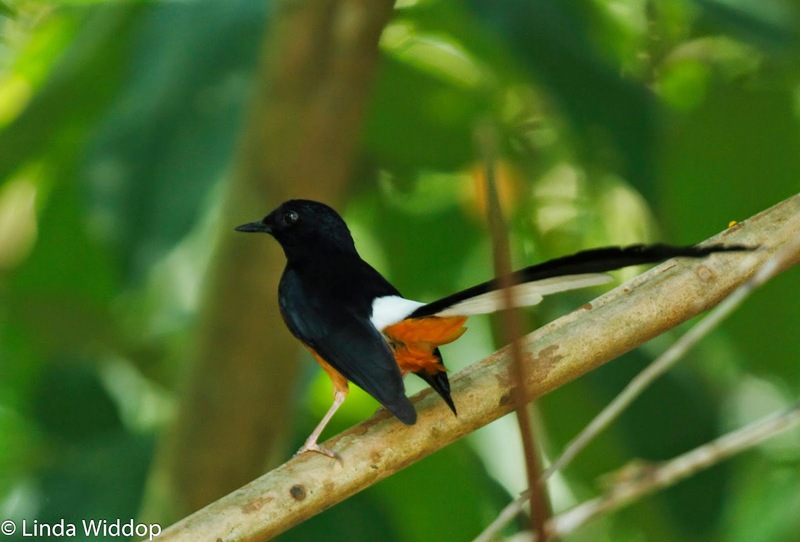 A common bird in the area is White-rumped Shama which I finally got a decent photo of on the island. 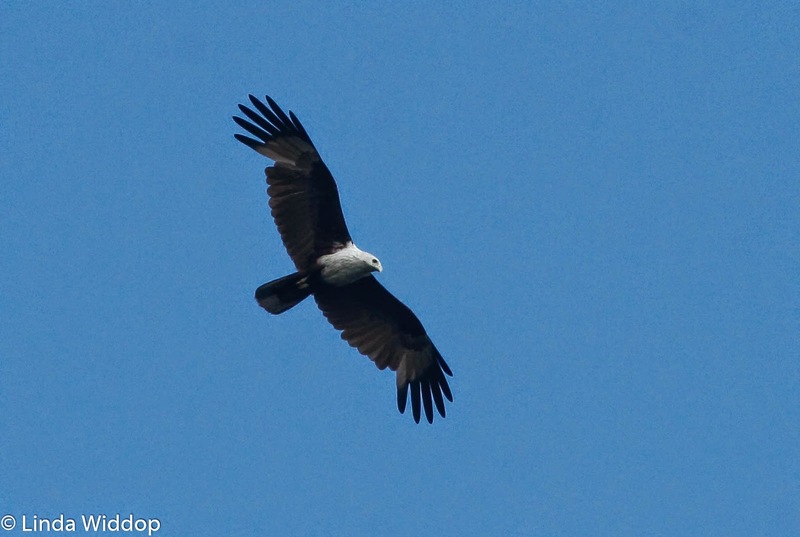 Another common bird over there is Brahminy Kite. They are as common as our Red-tailed Hawk. I will leave you with this - Singapore was a trip of a lifetime. 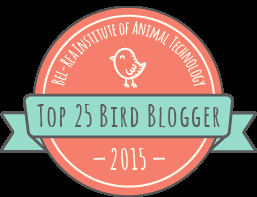 We ended up with 110 new species of birds, experience of other Asian animals, people and culture. Worth the trip. 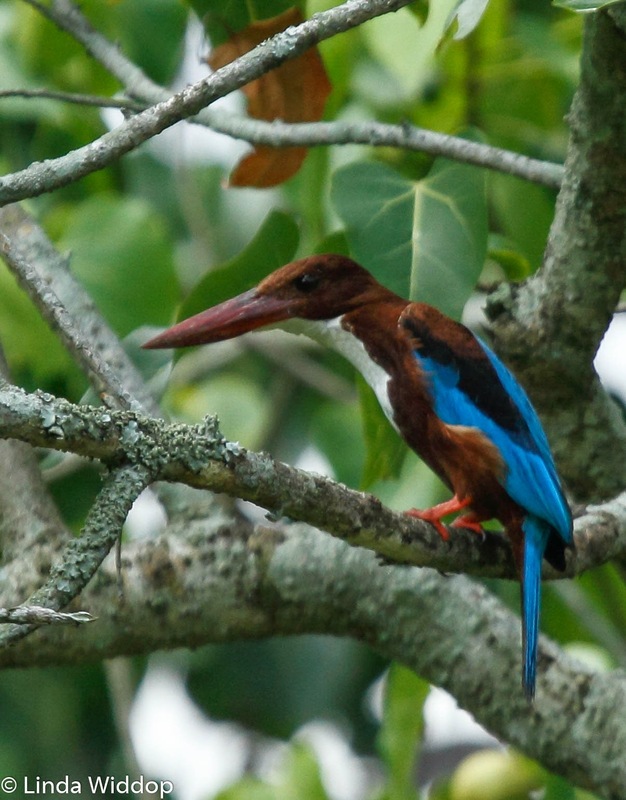 I'll leave you with this too - a White-throated Kingfisher that we found at the Singapore Botanic Gardens.